As an avid and slightly addicted Disney World fan, I wasn’t sure how Disneyland would measure up. After moving west and becoming Annual Pass holders, we came to one conclusion, it doesn’t… Disneyland is in a league of its own. There truly is something magical about walking down the same Main Street Walt did and we love that you can access both Disneyland and Disney California Adventure by simply walking across the sidewalk. This park has some “magic” you can only experience there. Here are a few of our favorites you won’t want to miss on your next trip to Disneyland. 10. Finding Nemo Submarines (Tomorrowland) – This ride has just reopened after a refurbishment and it is better than ever. Sit in a submarine and dive into the ocean to follow Marlin and Dory on their adventures. What’s fun to love about this ride is there isn’t a bad seat in the submarine. Everyone is guaranteed to see Nemo and all his underwater friends. 9. 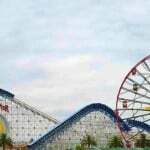 Mickey’s Fun Wheel (California Adventure) – Can you say “A ferris wheel the way only Disney can do it”? You will want to ride this more than once to get the full experience. There are two kinds of cars on this Ferris wheel. The outer cars are the classic stationary kind that simply rock slightly when the wheels moves… or when your kid swings in them. If you like things a little more daring, ride the inner cars. They are on a type of rail that moves the cart forward and backward on an angle. The wait time is a little longer for these cars, but it is right next to Paradise Pier and if you time your wait just right, you can catch Goofy conducting the dancing fountains. 8. Grizzly River Run (California Adventure) – Grizzly River Run is a water raft ride. If you need to cool off, this is the place to do it. It is a longer ride then most of its kind, so definitely worth the longer wait. With some fun dips and turns, along with places for spectators to aim water at you, it’s become a must for our family. 7. Indiana Jones Adventure (Disneyland) – My oldest son would say this is his favorite ride, my youngest won’t ever ride it again (he hates roller coasters). This is a very fast, thrilling ride that takes you on an adventure with Indiana Jones, complete with rolling giant boulder. It’s not for the faint of heart or sensitive to sound and you should get a FastPass for it because the wait can get long, but it’s such a fun ride, that it makes our list every visit. 6. A Bug’s Land (California Adventure) – While Disney World’s Animal Kingdom does have “It’s Tough to be a Bug”, they don’t have the 3 or 4 other attractions that make this hidden gem a must. Tucked away behind tall trees is a land made to make you feel like you have just stepped into Flik’s world and became his size too. They have Tuck and Roll bumper cars, Heimlich’s Chew-Chew train, Flik’s Flyers and Francis’ Ladybug Boogie ride. The waits are never too long and there is so much to look at while you are in line, that it goes by quick. Make sure to visit at nighttime also to see the lightening bugs light up the sidewalks while holding on to giant bendy straws. 5. Matterhorn Bobsleds (Disneyland) – Before the Yeti, there was the Abominable Snowman. The Matterhorn is a Disney staple. It is a bobsled ride through and around a Swiss mountain with a visit from “THE” snowman, and we don’t mean Olaf. Even my little guy loves this ride. It has just enough thrill for him and still a sense of danger for my oldest. A classic Disneyland ride. 4. California Screamin’ (California Adventure) – Yes, the name says exactly what you will be doing. 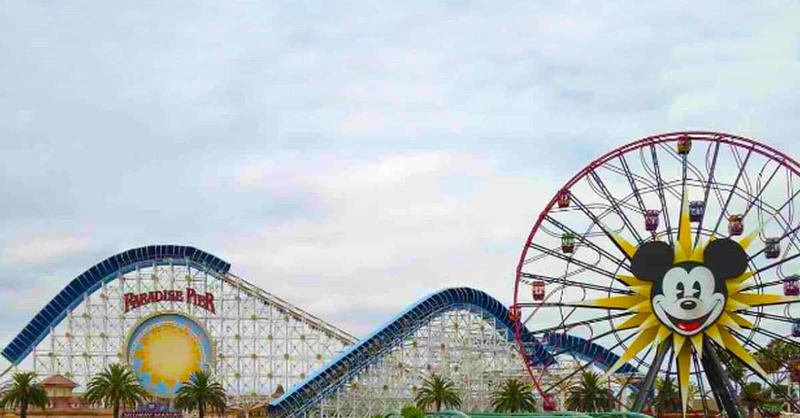 It’s a roller coaster built over and around the Paradise Pier in California Adventure. Disney even was nice enough to count down for you (done by Neil Patrick Harris) before sending you flying down the track. It has some great loops and if you can keep your eyes open, some great views of both parks. 3. Mickey’s Toon Town (Disneyland) – We were sad to see Toon Town go at Disney World and are glad it has lasted at Disneyland… for now. We usually hop on the steam train from Main Street and ride it over to the Toon Town stop. There is Gadget’s Go Coaster and Roger Rabbit’s Car Toon Spin that we love riding before walking through Mickey and all his friend’s houses. All the houses are fitting to each character and fun to stroll through. 2. World Of Color Show (California Adventure) – While this isn’t a ride, it is by far one of the BEST Disney shows and you won’t want to miss it. Shown in Paradise Pier, in front of the Ferris wheel, this water and laser show will take your breath away. The water is shot through the air and acts as a screen for laser clips, pictures, colors and characters set to Disney music. Any description I offer will be selling this show short. It’s that good. They have a special holiday show starring Olaf that runs through January also. I have no doubt, this will become one of your favorites too. 1. Car’s Land (California Adventure) – The only thing we love more than World of Color, is visiting Radiator Springs. The most popular attraction here is the Radiator Springs Racers. FastPasses for this are usually out by 10am, so grab them while you can. The ride takes you casually through Ornament Valley before you hit the race track for a fast ride. The views at night are the best. While in Car’s land make sure to ride Luigi’s Flying Tires (set to close in February 2015, boo!) and Mater’s Junkyard Jamboree. If you time your visit with the sunset, you can watch as all the neon lights come on and illuminate one of Disney’s greatest attractions. 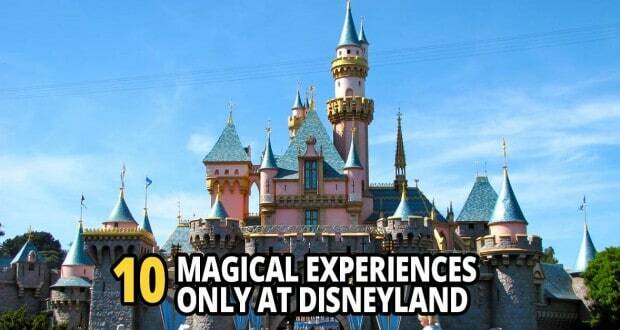 Disneyland and California Adventure have so much to offer and while you can’t go wrong with any of the attractions, I am sure some of these will make your top 10 as well.